If you emailed them, you should be hearing from Joseph Erb. His presentation at TypeCon New Orleans jumpstarted the interest in Cherokee, and was one of the most heartfelt and informative presentations I have ever witnessed. You need to distinguish the letter E (Ꭱ, second letter in the top row) from the letter SV (Ꮢ, third letter in the fifth row). The latter's tail should meet the baseline in a serif. The two letters that look like a Sütterlin S also seem indistinguishable, other than that the second one has an unsightly blot near the exit stroke. EDIT: I mean QUI and TLU, apparently. Took the time to elaborate that without step by step online instructions the likes of Polish Diacritics - How to? and VietnameseTypography type designer eager to help them out are bound to work from more or less flawed models, and could very well be fine-tuning wrong letterforms. i.e. the whole matter is a Catch-22 to perpetuate bad designs for their script. Still no reply. Maybe the e-mails on the screen in the YouTube lecture have expired... I can't know. I also clear that this design is a part of a much bigger set, involving almost all Latin and Cyrillic glyphs, and this is to be interpolated across around 8 weights + corresponding italics; that I could not allow myself to distribute wrong Cherokee glyphs and will leave them out completely if they don't get reviewed in time before the release deadline, which should be around May if all goes smooth. Maybe I was bit too enthusiastic about the whole matter, could also be that there is something going on over there, or that an e-mail got lost... No idea. Unicode has recently added casing to the Cherokee script. Will you add lowercase syllables to your fonts? As noted above, I need a native speaker to review the caps first. Are there any diacritic marks used with Cherokee? I assume not but I thought it would be better to check. Are there any diacritic marks used with Cherokee? I suppose not, what a pity! I’d like to see Cherokee with a Vietnamese or ancient Greek sort of accents invaded … delicious. Now this is going to be double fun. Not to speak of the upcoming Cherokee blackletter releases. I thirst for innovations. As far as I can see the lower case is just a scaled down version of the upper case, sort of like Cherokee Small Caps. An interesting variation might be a stylistic alternative which takes the characters back to Sequoyah's original script version of the characters. There is a Cherokee blackletter. … Sequoyah's original script version of the characters. I guess this version is not a stylistic alternative (in the OT sense) but rather the actual and original model for a typographic minuscule rendering. At least, to me, it looks like a suitable draft, for both upright and Italic sorts. do you care to give a pointer? The lowercase is not just a smaller version of the UC, as every lc before it, it is more written out and more cursive, the letterforms change, sometimes there are even variation in the same letter. Please check the video I posted above for more information - it features a hand written letter in Cherokee. The whole process is very much similar to watching Greek or Carolingian minuscule develop - in our lifetime. And this includes a strong neophobia, which explains perhaps why things move so slowly. And I'll also show what I comissioned and intended to use in the presentation. I realize now it was a too heavy investment, but the money went for a good cause, so that's that. A meeting in heaven, a meeting of equals. Cherokee is a tonal language, but tones are traditionally left unmarked. For educational purposes, one may use several diacritics over a letter. In addition, a diacritic below a letter can signal shifts in consonantal pronunciations. See section 8 of this Unicode document. One year of no response. Judging from age statistics and other materials, I have the feeling they may want to leave the syllabary become obsolete. Everything I see about the Cherokee syllabary says that it's a source of great pride to the Cherokee nation. So it's hard for me to believe that... of a certain "they", that is, the people who set up the web sites I saw or the videos you saw. On the other hand, it's easy for me to believe that many of the ordinary people in the Cherokee nation, particularly the young, have enough pressing concerns that taking the time and effort needed to keep the Cherokee language alive, never mind its writing system, is not high on the list of priorities. That may be sad, but I don't know that there is a good solution to it. That is, a good solution other than improving the situation of the people; obviously, if the Cherokee nation had the population, and GNP, of, say, Japan, they would, like the Japanese, have no particular problem preserving their language and writing system. But at the moment, that the individuals in the Cherokee nation have English as their first language, and use it to improve their individual situations by interacting with the economy around them, is obvious enough to take as a given. 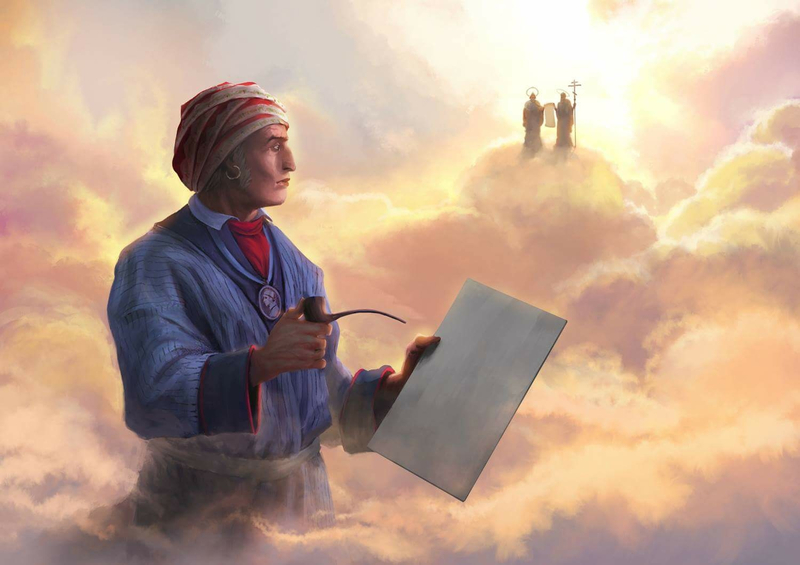 Oh... is that Cyril and Methodius that Sequoyah is meeting in Heaven? Loosely related, I had trouble finding test words for some African languages like Hausa or Fula, because the Wikipedia articles often replaced the hooked letters with plain Latin, as does Google Translate. Fun fact, letter d with hook could be made into a ligature just like f_i. I got a short answer from Mr. Erb and which left me no wiser. Truth be told, I have no great desire to develop such fonts any longer I thought I could tap into an unexplored niche but I am tired of waiting. which concern one effort to design a modern Cherokee typeface based on revisiting Sequoyah's original work, and another effort that involved collaboration and consultation with the Cherokee nation. For anyone seeking to support the Cherokee syllabary, it looks to me as though these two articles are excellent basic resources to start from, given that there's little opportunity for outsiders to get a "feel" for the script. As for Cherokee lowercase, all I could find was that a typeface called Phoreus Cherokee provided a small-caps style lowercase as a way to better match the color of English in bilingual texts, and so it doesn't appear that any attempt is really underway as yet to repeat what the Carolingian miniscule did to uncial. Not that I'd want to discourage anyone; after all, I'm the one who was bold enough to point out that the earliest forms of the Semitic script, as they included ascenders and descenders, could be used as the basis for a Hebrew lowercase not cribbed from foreign sources such as the Latin alphabet... if anyone wanted such a thing. But this does mean that despite what Unicode has reserved, there doesn't seem to be any indication of a real interest among the Cherokee in a lowercase for their syllabary. The trouble is, of course, my information is extremely incomplete and fragmentary. My suspicion, though, is that this indicates a situation of "they have no resources" rather than "they have no interest". The works of well-meaning outsiders are better than nothing. But apparently there is not one native speaker of Cherokee who has picked up a copy of FontForge and expressed what the script is supposed to look like from an authentic point of view. That may not be the case, of course, as my search was just an initial cursory one. So I have no way to know, for example, whether or not the Cherokee have, by now, gotten used to what Samuel Worcester did to Sequoyah's original script, so as to come to regard its characteristics as an intrinsic part of how it should look. (The initial skepticism of Cherokee elders concerning Microsoft's desire to produce a sans-serif Cherokee appears to hint in that direction.) Which would be kind of the most basic fact to know before starting on a project to produce an improved Cherokee typeface. ...which, I suppose, should lead me to downgrade the term "excellent" used above. It's starting to look like "better than nothing" (in this case, for resources, rather than typefaces) is the best there is. But apparently there is not one native speaker of Cherokee who has picked up a copy of FontForge and expressed what the script is supposed to look like from an authentic point of view. That may not be the case, of course, as my search was just an initial cursory one. As mentioned earlier, in 2011, Joseph Erb & Roy Boney of the Cherokee Nation came to TypeCon to present Typography of the Cherokee Language Through History: The Positive Effects of Orthography and talked to various type designers about supporting Cherokee. That's part of how Mark Jamra ended up designing Phoreus Cherokee, and worked with folk of the Cherokee Nation during that process, as I recall. An update in 2015 added lowercase. Indeed, public discourse is not about its participants. From one of the pages in the links: there are 316,000 Cherokee, but only 22,000 of them speak the language. This is not an unusual situation for Native American languages. So the obvious question is whether the survival of the Cherokee language would be helped more by better typefaces for the syllabic script of Sequoyah... or by switching to use the Latin script, with which the target audience, people who are Cherokee but don't already speak the language, is already familiar. With that kind of an elephant in the room, the importance of typography recedes. Cultural authenticity and diversity are valuable goals, but naturally they take a back seat to survival, and thus economic limitations can threaten them. Mark Jamra: that doesn't sound like a Cherokee name. Yes, he did so as the result of an effort by people from the Cherokee nation aimed at increasing interest by typographers in the script, and, since his work was at least reviewed by native speakers, it can provide some guidance. So I feel strong doubt that sufficient resources are available for a credible attempt to see a Cherokee typeface as it looks through Cherokee eyes. And that those who could help are too busy with pressing concerns to be of much help to... outsiders who might, for all they know, be little more than dilettantes - should surprise no one. Even those who have good reason to feel they're being unjustly dismissed; I certainly don't know what may be keeping Joseph Erb busy these days, but, that the straits of the Cherokee language and people are likely parlous, I can easily imagine he has plenty of things to keep him busy. So the obvious question is whether the survival of the Cherokee language would be helped more by better typefaces for the syllabic script of Sequoyah... or by switching to use the Latin script. One of the most important things when working with indigenous groups is knowing what is a question for you and what is a question for them. This is a question for them. Having better fonts helps them to answer it; not having the fonts answers it for them. A designer is supposed to answer questions laymen don't even [have to] realize exist. I agree it's not up to us to make that decision. When people from the Cherokee nation asked for help in making font support for their language available on computers it was a good thing to respond to that request, and do the best that one can. From what the original poster has written on this thread, though, it's possible that this request has... expired. My point is therefore if Mr. Erb and others don't have the time at the moment to work with type designers, he may have good reason. It is their decision - either way. I doubt that the script has been given up on, instead, I suspect it is simply that the requirement for typeface support has been met, at least for the time being, and other priorities are now being attended to. In good time, we may learn more. Vasil, it would be a shame for this work to go to waste. I would reach out to the Cherokee Immersion School... https://cherokee.org/Services/Education/Immersion-School - you might not get actionable feedback from the kids and staff, but at least they'd have something new to use - and that was the basis of Joseph and Roy's call for fonts in New Orleans. Also feel free to contact me off-list. I have a couple of other thoughts that might be useful.